Andy Peaks wants AFC Rushden & Diamonds to make a quick start when they take on Hitchin Town at Hayden Road tonight (Tuesday). Diamonds are bidding to bounce back after their Buildbase FA Trophy hopes were ended in a 2-0 defeat at Witton Albion at the weekend. 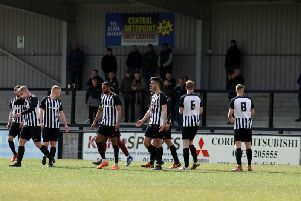 It’s back to the Evo-Stik League South Premier Division Central action this evening with Peaks’ team set to face a Hitchin side who sit second from bottom with just one league win to their name so far. But Peaks isn’t fooled by the Canaries’ league position as they come into the game having had their fine run to the first round of the Emirates FA Cup ended in a 2-0 loss to Vanarama National League side Solihull Moors on Sunday. “We need to come out and play at a high tempo and really try to get off to a good start,” the Diamonds boss said. “They are a better team than their league position suggests and the run they had in the FA Cup just proves that. “But I am not worried about other teams, I am focusing on us and what we do and getting the best out of what I have here. “It’s very much a case of back to the drawing board after the weekend because we have had a couple of defeats and we need to make sure we are getting the basics right. Peaks felt Diamonds exited the Trophy “a bit too easily” at Witton but he is hopeful of having the likes of Declan Rogers and John Dean available again after they missed the game. And he also confirmed he is still on the hunt for a couple of new recruits to boost his squad. He added: “I thought we were good for 20 minutes but once Witton got the goal, they made it difficult for us. They managed the game really well. They are a strong team who are in a false position in their league. “But I just felt we went out of the competition a bit too easily to be honest. “We weren’t good enough on the ball and our final pass wasn’t up to scratch when we got into good positions. “For us, we need at least seven or eight players to be performing to their full potential if we are to do well and we haven’t had that in the last two matches.